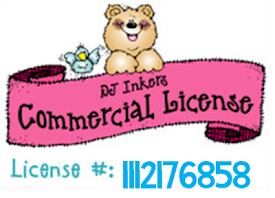 I LOVE clip art and fonts! 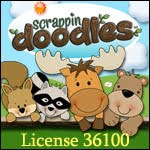 I have been restraining myself from all of the CUTE Christmas clip art on Scrappin Doodles. I have a serious addiction to fonts too. Ummm, I might be beyond addiction....I have downloaded 1,222 fonts. 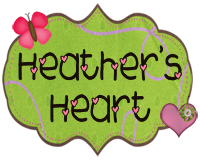 Yes, my name is Heather and I am a FONT FREAK!!!! I am a beach freak too. The beach is one place I can totally relax. I love the sound of the waves as I read a great book. So, this beach clip art makes me VERY, VERY happy! Thanks so much for sharing...not quite ready for it in total, but I am sure it won't be long and we will be using this. This is great! I have been working on helping kids identify these endings this week and this will be a perfect addition to our activities! I, too, am a clip art, font, and beach junkie!! Nice to know there are more of me out there! Thank you for the freebie! I love this!! The kids are going to love this. Thank you so much for sharing!!!! I don't want to embarrass myself and tell you how many fonts that I have on my computer...but let's just say...I might need some more memory pretty quick! Well I might be exaggerating a bit... but not a whole lot!!! Love these! Thank you for sharing! I just came across your blog a few weeks ago, and I am so grateful for all of the things that you share. My students are loving the Magic e game, so I'm sure they will love this game as well. It is also the perfect timing because we are talking about -ing and -ed endings this week. Thank you so much! You are my new go to blog! You have no idea how helpful this game will be. I literally just assessed my students and noticed many need help with -ed endings! Thanks so much! Thanks for sharing - I LOVE this!!! We are studying the SAME things and this is awesome. Can't wait to use it! 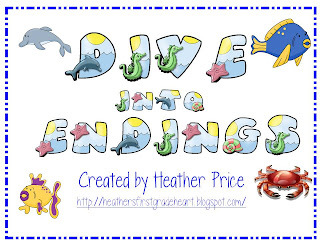 Heather, I just discovered your blog this morning via Pinterest and am already hooked. Thank you for sharing your wonderful ideas. I've been teaching for 41 years now and still LOVE finding new ways to help our first graders. Thanks again. Thank you for the Great Word Endings Game. My students will love it! *Way to go Heather! 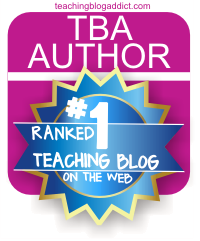 You have one of the best blogs with so much information and great ideas! That is so so kind of you to share your work! Thanks for the ideas. Hey Heather...You are amazing. Thank you for sharing this terrific book with us. I purchased it right after you wrote about it. It will be my summer pool reading book this summer. It gives great insight to kids. Also, I love the ending download. You are great. I really wish you could help me with the google doc download. I am having all kinds of issues with downloading. Email me if you could give me some pointers. Happy end of the year. YOU my dear are a RockStar:) Thanks so much for your gift of sharing ~ I forward many of your blog posts to my coworkers!! Heather, this is terrific! I teach second grade, but my kids can totally use this. :) Thank you so much!